MOUNT TAMALPAIS, Calif. – The folks at AT&T kindly sent Fortune’s San Francisco bureau an iPhone 3G on Friday to try out. Now, Green Wombat is a Mac kind of marsupial but no Apple (AAPL) fan boy. 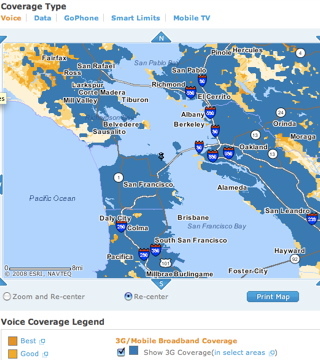 So over the weekend I was most interested in how the new phone performed in the Bay Area’s topographically diverse terrain, where mountains, valleys and exceedingly tall redwoods can play havoc with cell signals. More to the point, how fast and useful is the GPS-enabled Jesus phone on the mountain bike trails that surround San Francisco? After all, this is a place where you can be sitting on the 19th floor one minute and a half hour later be bombing down a fire road on a stretch of state park that seems as remote as the Sierra. But we still want to be connected; witness the techies texting on the trails or the matchy-match Mill Valley cyclists pedaling their $6,000 rigs, BlackBerrys aloft, to the next peak in search of a signal. On Mount Tam, I pick a trail I haven’t ridden before – one with a hard-to-find entrance – to test out the iPhone’s GPS. Although the mountain is an EDGE zone, the GPS-Google satellite maps mashup pinpoints my location with a luminecent blue dot, allowing me to zoom in and see that I’ve just passed the trailhead and that if I backtrack I’ll even find a small gravel parking lot hidden by a stand of trees. Sweet. After riding a few miles through groves of bay laurel and redwood, I check my coordinates. Zooming out shows me just how long of a steep climb I’ve got ahead of me – maybe too much information. Still, this is pretty bloody cool and I snap a photo of myself that the iPhone geotags. I’m a happy rider. I compare the iPhone’s signal with my BlackBerry and they’re pulling the same number of bars, though I’ve noticed the iPhone can be much slower to grab a signal when rolling out of a dead zone. At the crest of the hill there’s a turnoff to another trail I haven’t ridden. It’s hot and my legs are getting tired, but it looks like a fun run. Problem is, just how long and steep will this side trip be? Without the iPhone I might have given it a pass. But I move into a clearing, catch a signal and GPS myself and then take a virtual ride on the trail to see where it goes and check out the terrain. (It’s also a great way to cut down on the environmental impact of driving in the city by optimizing routes.) Looks good. 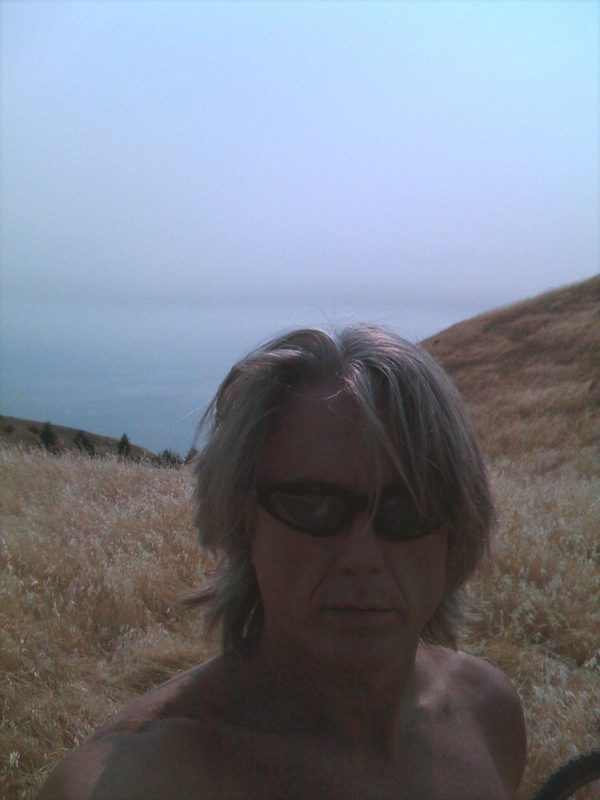 It turns out to be a great spur, taking me to the Bolinas-Fairfax Ridge overlooking the Pacific Ocean. While enjoying the view, I contemplate writing this blog post on the phone (WordPress has been iPhone-optimized for that) but ditch the idea, given iPhone’s lack of a cut-and-paste function and inability to import photos to the post. While the prospect of not having enough juice to listen to tunes on the way home is no fun, the iPhone is a great biking companion. (An iPhone app I want to see: one that collects distance and altitude data from the bike’s wireless computer.) In fact, why go home? I finger-flick through the iPhone weather report for the beaches at Point Reyes. Sunny and 82.